The sea around Lundy Island, off the coast of Devon, has become the first marine site in England to be protected by new government powers. The Marine Conservation Zone (MCZ) around Lundy will help to preserve important habitats and species. It is the first of many areas along the British Isles' coast where damaging maritime activities will be restricted. Lundy's waters are home to a multitude of marine life including seals, lobsters and a variety of corals. 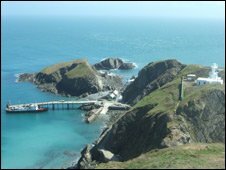 Prior to becoming an MCZ, which was set up under the Marine and Coastal Access Act, Lundy was also England's only Marine Nature Reserve and the UK's first No Take Zone, where fishing is banned to protect corals and other marine life. Specific conservation objectives for the island, which is just three miles (4.8km) long and half-a-mile (800m) wide, will now be developed and the plans open for consultation. Local byelaws will remain in place to protect the island's wildlife and new local laws will also be put in place to protect the zone from human activity which may cause damage. Huw Irranca-Davies, Minister for the Marine Environment, said: "With the new Marine Conservation Zone around Lundy Island we have taken the first step in creating a network of marine protected areas. "We can't always see what is happening to the wildlife and habitats under our seas, but they need just the same protection as those on land and this world-first in legislation will provide that." Four regional projects have have also been set up to work with local interest groups and businesses to identify additional areas to designate as MCZs.